These selections comprise our North American Indian Relics, mainly from the middle United States. 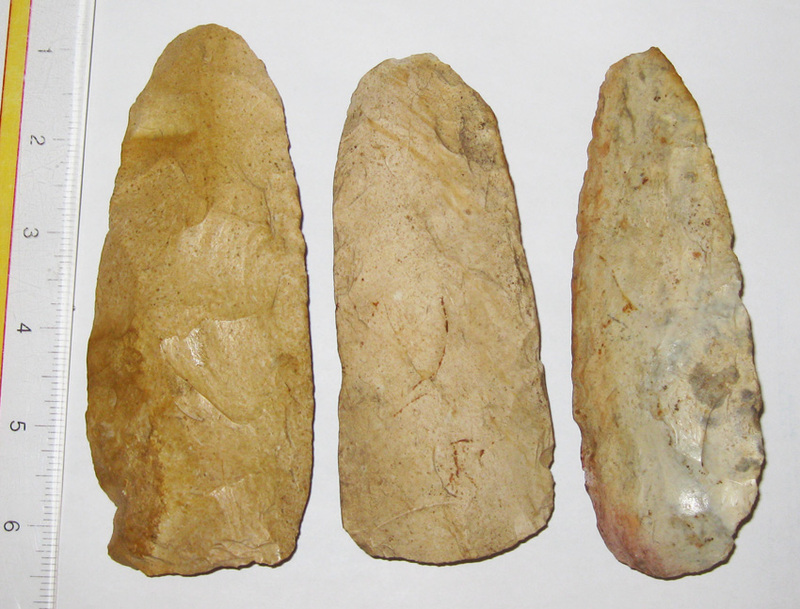 The inventory offers a grouping of artifacts ranging from Prehistoric and Historic Indian artifacts of flint, pottery, stone, beadwork, textile, and other mediums. ALL pieces are GUARANTEED authentic. Middle Archaic Period, circa 5,500- 1200 B.P. NA243 This is a fantastic precision crafted Ohio butterfly banner from Richland County, meticulously crafted from a brown veined banded slate. I cannot overstate how well crafted this example truly is. At 5 1/16 inches wide and 2 1/4 inches tall, the balance of this example is precise so much that on either side, it sits perfectly balanced almost as if it could be used for a construction level. 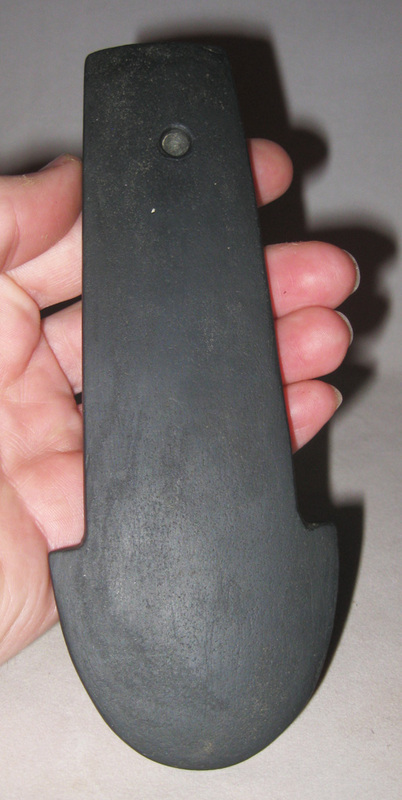 Example has one ancient ding midway to one side of a wing, otherwise intact and excellent condition. 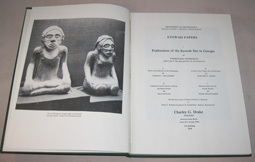 Comes with authentication papers from both Jim Bennett and Bill Jackson and is from the private collection of tribal art dealer Michael Cichon who collected it in the 1980's in Ohio. 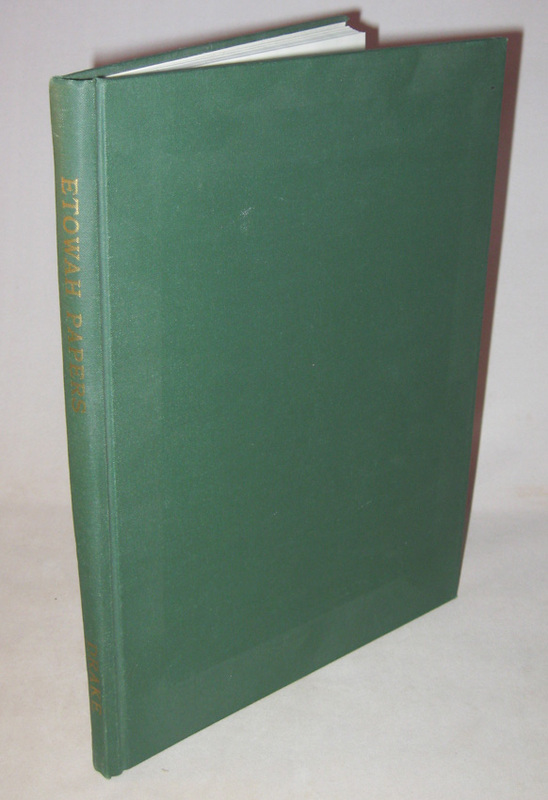 NA242 This First Printing of 1979 is the hardback book 'Etowah Papers' published by Charley G. Drake and a reprint of the 1932 Moorehead book and is a compilation of several academic papers related to the Etowah moundbuilder site in Georgia. 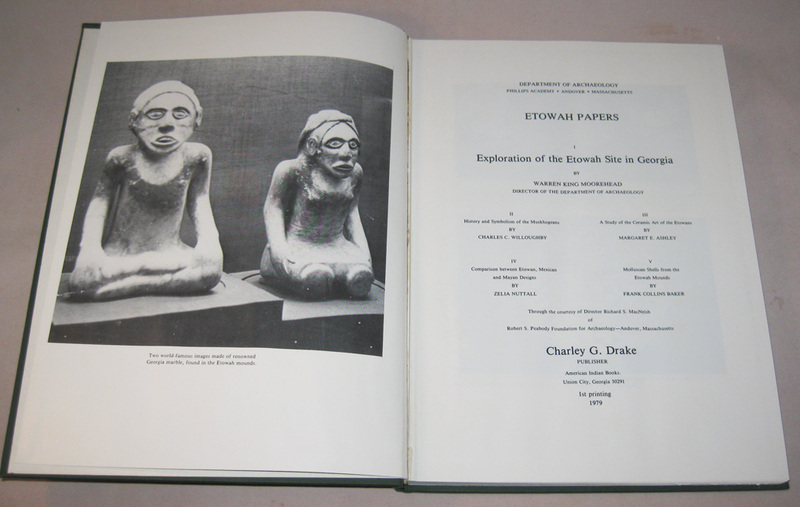 Chapters include 'Exploration of the Etowah site in Georgia' by Warren Moorehead; 'History and symbolism of the Muskhogeans' by Charles Willoughby; 'A Study of the Ceramic Art of the Etowans' by Margaret Ashley; 'Comparison between Etowan, Mexican, and Mayan Designs' by Zelia Nutall; and 'Molluscan Shells from the Etowah Mounds' by Frank Baker. 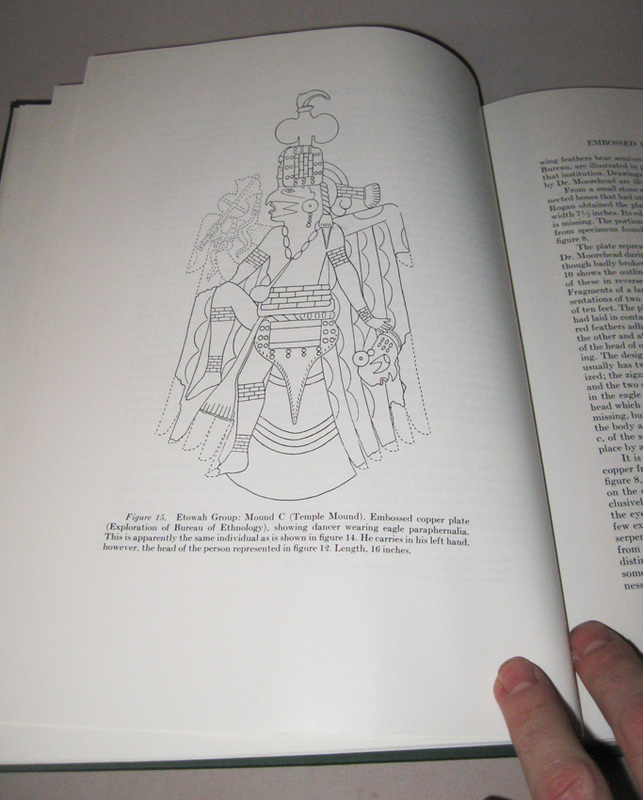 Book is in excellent condition, with no cover, the interior pages with a slight wave to them, otherwise, quite fine condition. 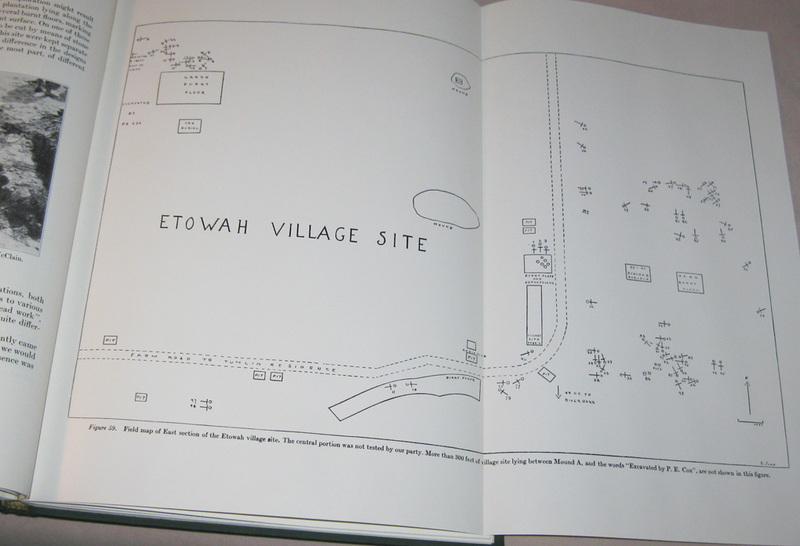 Filled with drawings and photos of artifacts of copper, shell, stone, and pottery, plus maps and graphs of the site. 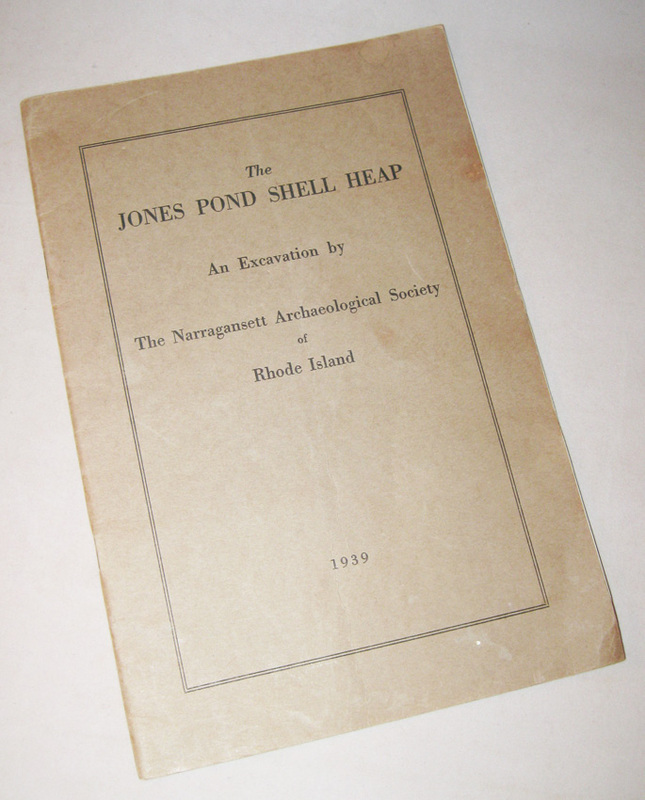 NA241 This rare booklet is an original paper booklet published by The Narragansett Archaeological Society of Rhode Island and titled 'The Jones Pond Shell Heap', printed in 1939. The 26 page booklet is a detailed archaeological examination of a famous discovery of the prehistoric Algonkian people and the field excavations of this site at East Providence, R.I. in 1938 by the society. 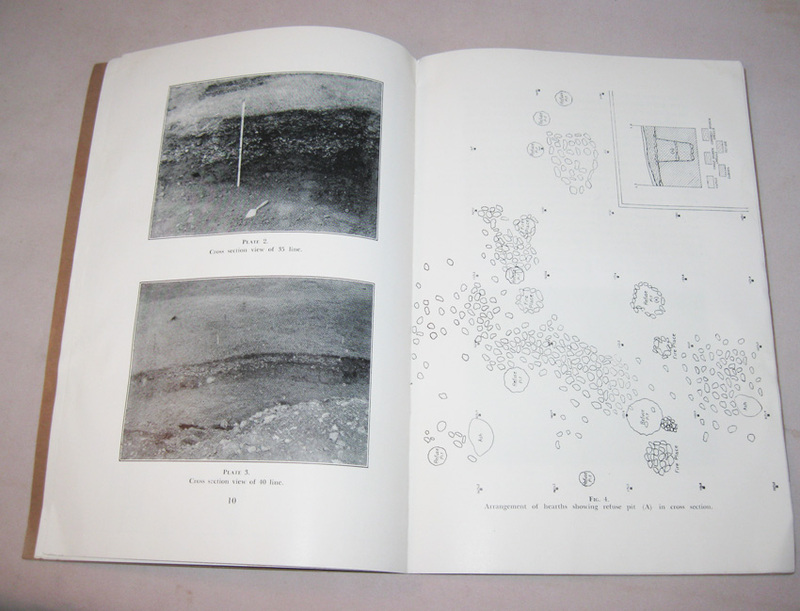 It contains topographical mapping and cross section drawings of the mounds as well as many photographs of the artifacts found and cross sections of the mounds. Late Adena/ Early Hopewell, circa 300BC- 100 A.D.
NA245 A fantastic Ross County, Ohio late Adena to Early Hopewell culture anchor pendant with a half drilled/ incomplete suspension hole, quite rare to see. Such an incomplete drilling would have, more than likely, been left unfinished due to an untimely burial and not having the time to finish the drilling before interring within the burial. 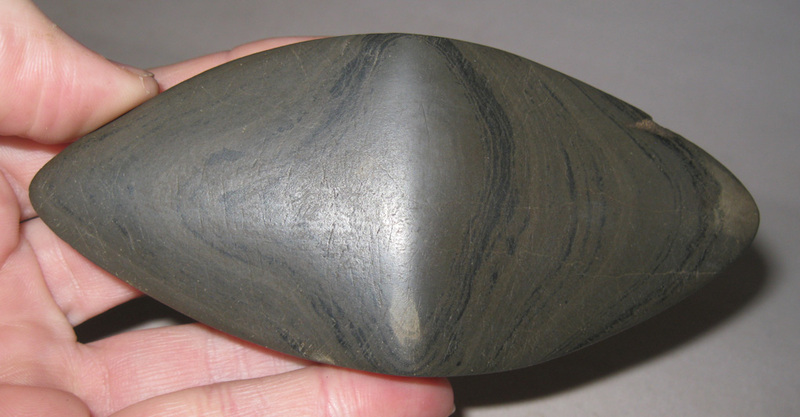 This example is intact, excellent condition, with only very minor edge losses, 6 5/8 inches long and 2 1/2 inches wide, very slab flat faces, and crafted in a deep dark gray banded slate. Comes with a Tom Davis COA from 2012 and originally collected in the late 1970's by tribal art dealer Michael Cichon. 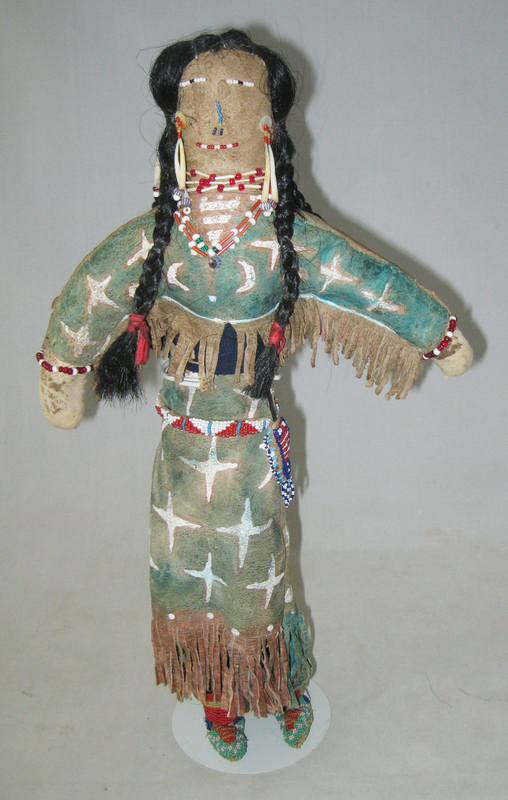 NA240 A large hide doll with janus image of a woman elaborately decorated with painted dress, shell and glass beading, and dual braided horsehair coiffure with silk ties.. 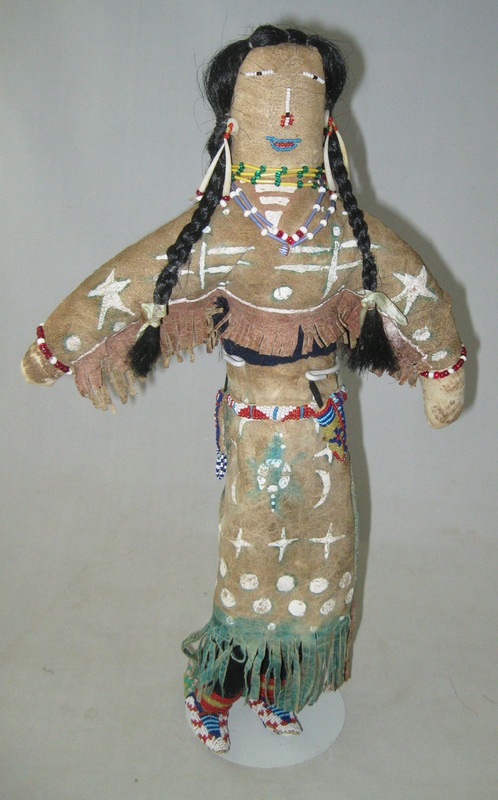 This impressive example stands a large 18 inches tall and 10 1/2 inches wide, wearing a shirt, long dress, and moccassins. 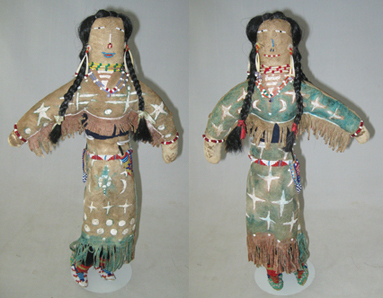 Interestingly, this is a janus form doll, with each side having different, though similar, versions of the woman expressing a duality. The body core is a stuffed linen with the legs covered in black felt, a black felt band separating the hide skirt and shirt, with the clothing painted in brown, green, and white with decorations of four point stars, crescent moons, dragonflies, spheres, and a turtle. 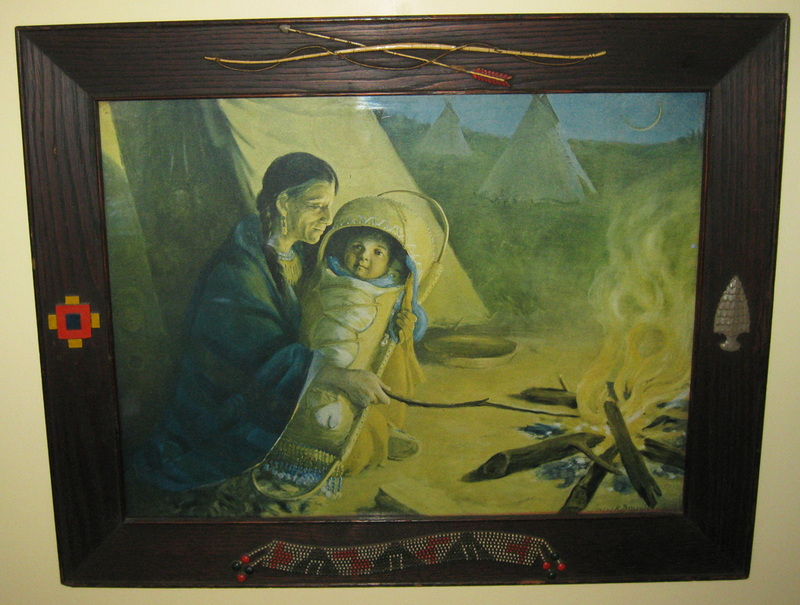 She is further decorated with trade beads of glass, including several Chevron beads on ear dangles and the necklaces; belt sash with knife sheath on either side, one in US flag design, sticks for handles; abalone buttons for ear ornaments and necklace pieces of dentalium shells; and janus pointed moccasins in a canoe form with two different designs. In wonderful, excellent condition, the doll has only random stains. 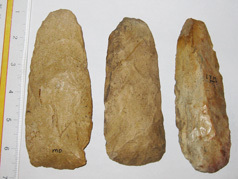 CL503 A set of three Pre-historic chert adze blades from the midwestern U.S., all similar, though from various locations. 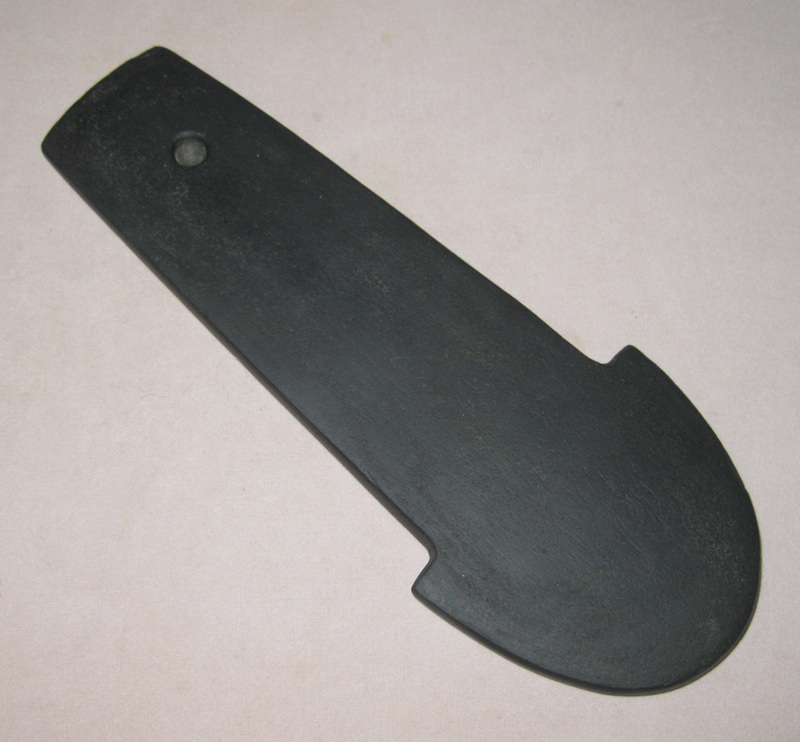 Two with a more squared bit for scraping and the more narrow width, thicker example has a more rounded chopping bit having strong polish and wear. 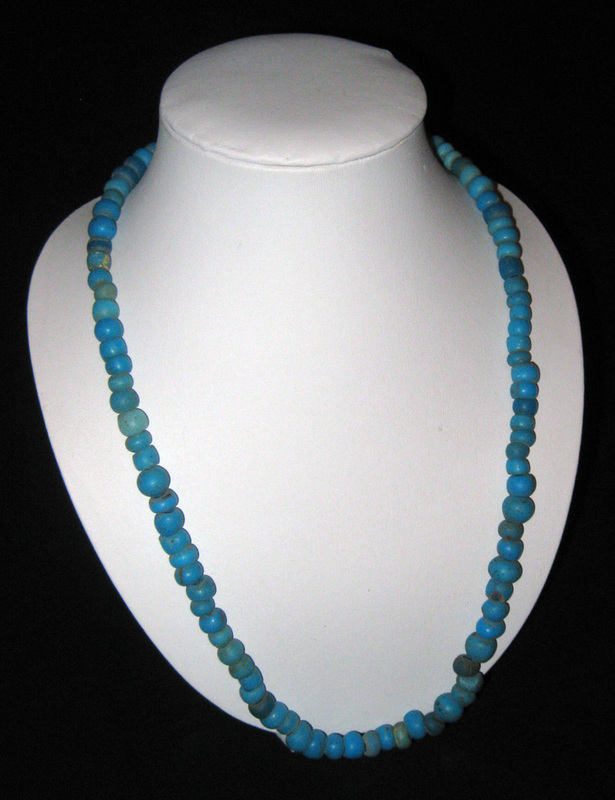 Examples measure from 5 1/4 to 5 3/4 inches in length, all with strong ancient patina and deposits. The larger marked 'MO', middle with no markings, and thinner with worn lettering and appears to have 'IOWA'. MP331 A vibrant strand of brilliant aqua blue glass trade beads that show extensive wear and strong patina. 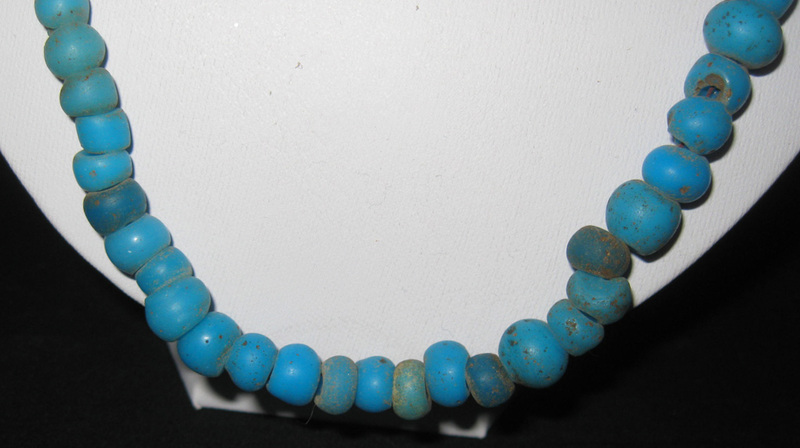 The wonderfully bright beads similarly colored with some being very transluscent and others solid and average size is around 1/4 inch in diameter. 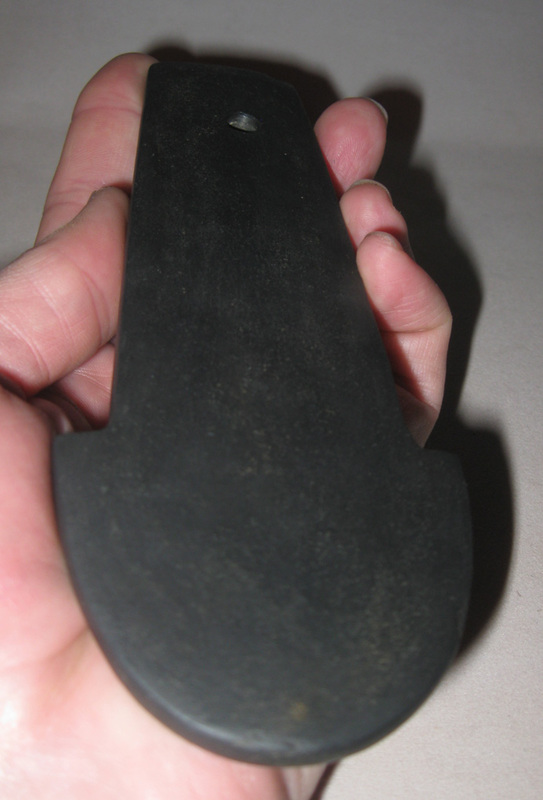 The strand measures 24 inches long. Such glass trade beads were, most likely, crafted in the mediterranean and then traded into the lower central U.S. territories, these, most likely, being excavated in Mississippi or Arkansas and dating to circa 1700-1750 A.D.
CL509 A very interesting Historic Sioux Native American shell collar. 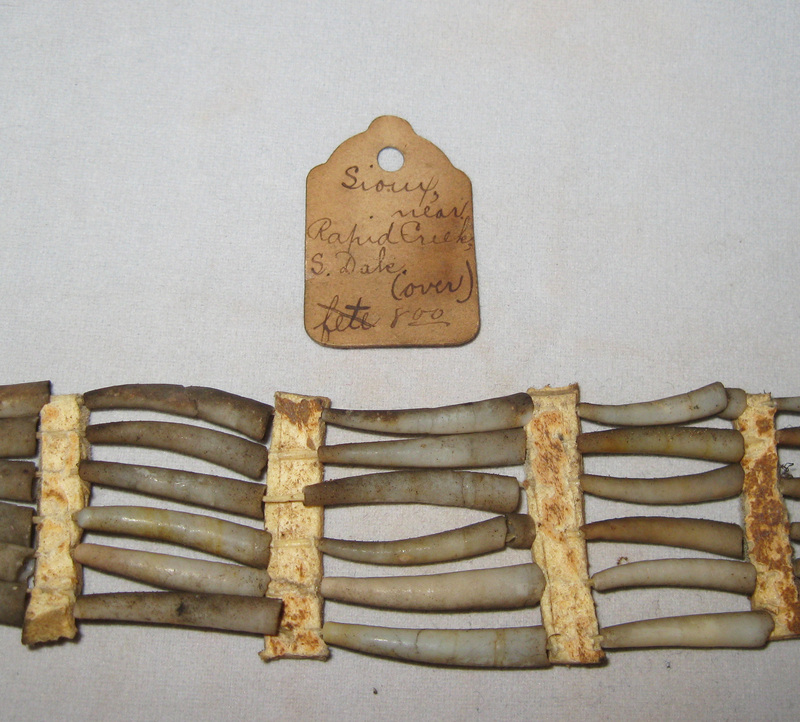 This band of shells and small wood pieces would have been a neck ornamentation at approximately 15+ inches long. The band is composed of long thin conical shells bordered by small wooden pieces, which were once painted, and bound with unusual transluscent fiber cording, tightly wound string, and sinew. An antique tag accompanies, and is a bit confusing. 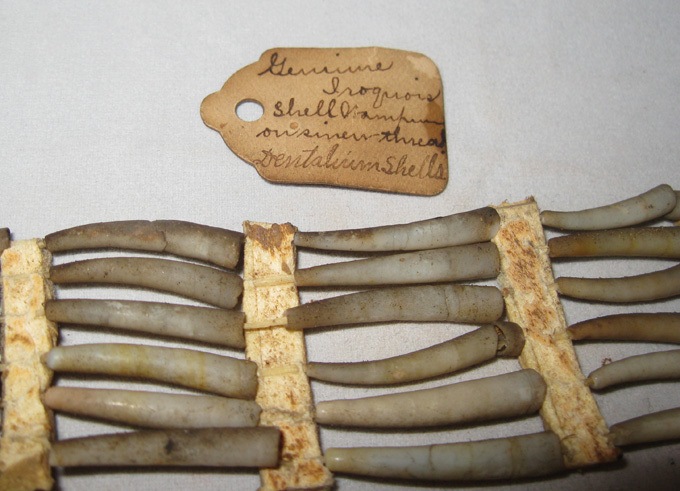 On one side of the tag says 'Genuine Iroquois shell wampum (?) ou sineu thread Dentalium shells'. The opposite side says 'Sioux, near Rapid Creek, S. Dak (over) fete 8.00'. 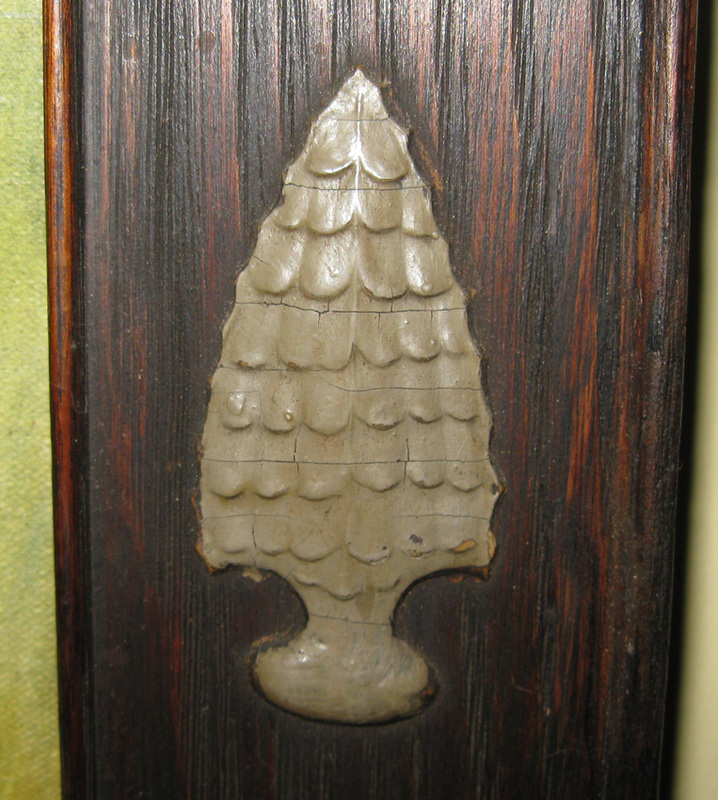 The tag appears to describe this object but an incorrect designation of 'Iroquois'. 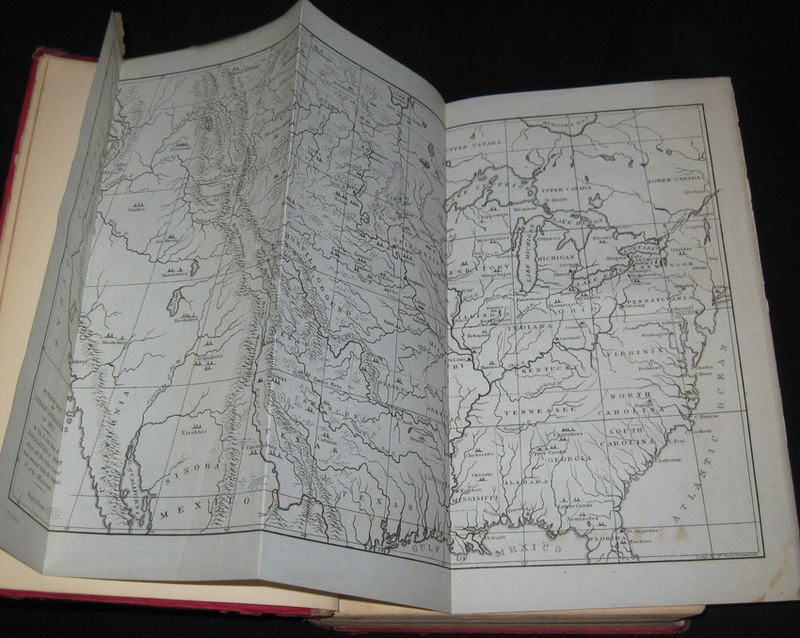 South Dakota, circa 19th century. 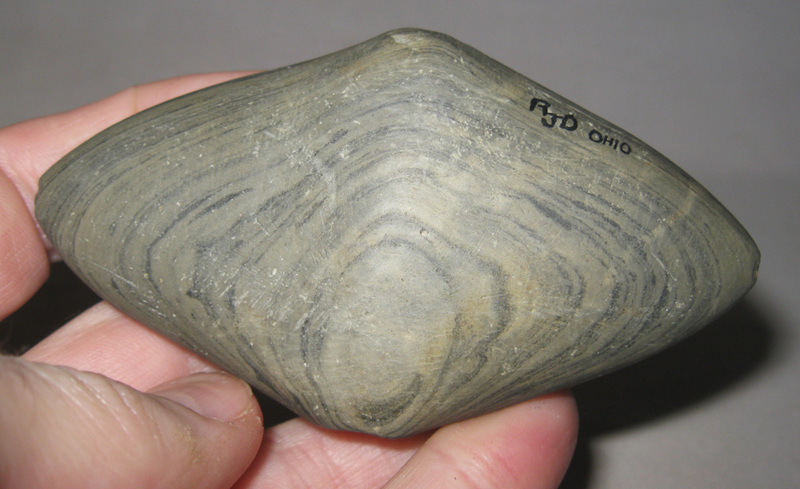 Middle Archaic Period of Ohio, circa 5,500-1200 B.C. NA244 A gorgeous small butterfly bannerstone with incredible choice of veining use so that this stingray-like form actually looks more like a clam shell. Absolutely beautiful. The banner is crafted in putty gray and dark gray banding of glacial slate with mineralized worm trails on the surface, one side with a more yellowed burial patina than the other, and measures 3 7/8 inches wide by 2 inches tall. The example is slightly lopsided in form with one side being a larger wing than the other. Intact with some tool scratches and the wing tips each with minor nicks. 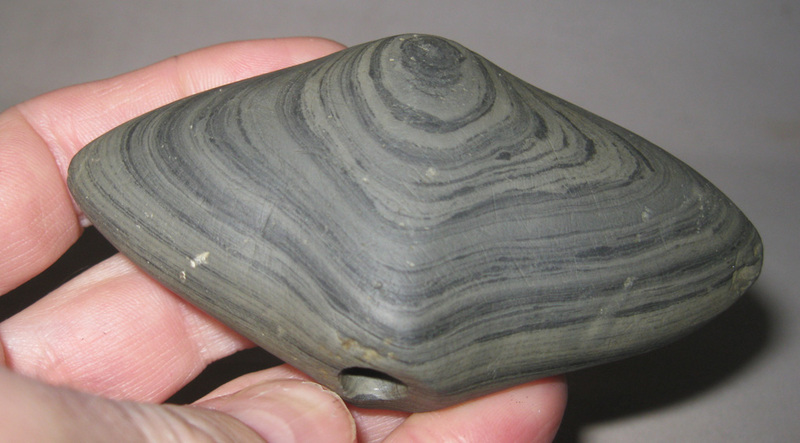 A very unusual and beautiful choice of material and exhibits strong wear. 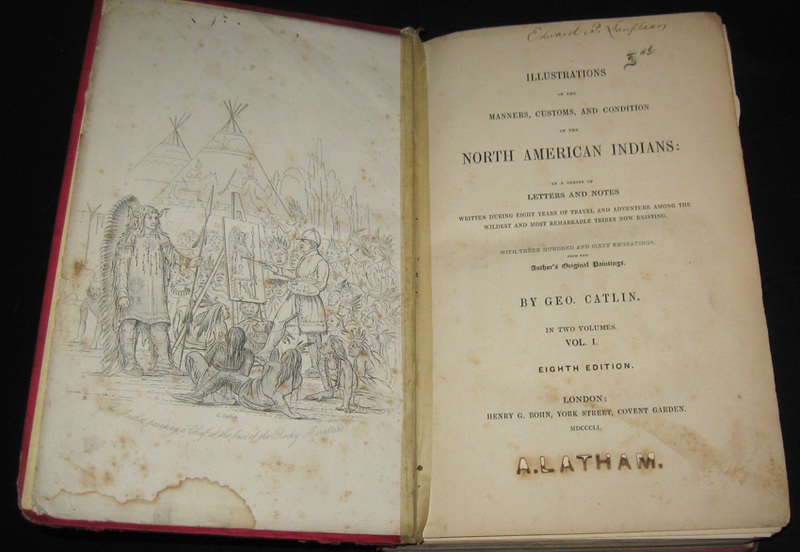 NA142 This two volume set of books is by the most famous of 19th century documentary artisans passionate to preserve the history of Native American Indigenous cultures. George Catlin is most famous for his 1830's portraits of Native Americans, which is now housed at the Smithsonian Art Museum. 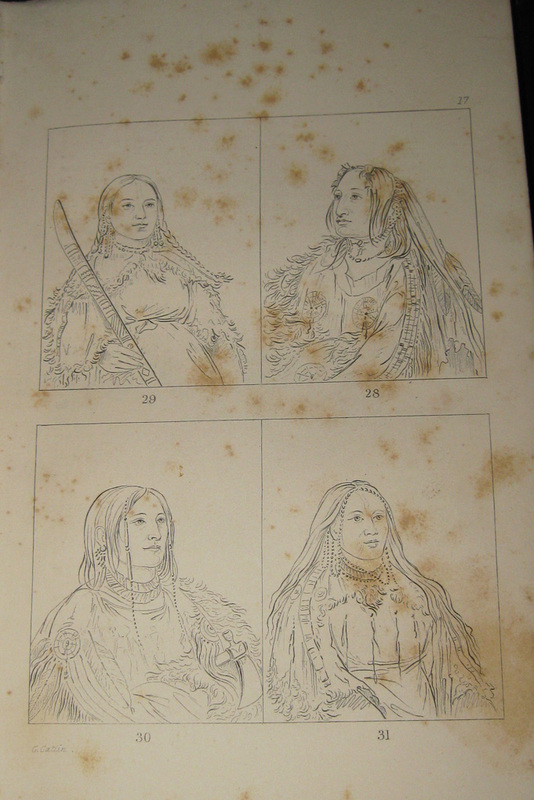 This set is an eighth edition of his popular book 'Illustrations of the Manners, Customs, and Condition of the North American Indians' and stated to have three hundred and sixty engravings 'from the Author's Original Paintings'. The volumes here are printed in London at the Henry G. Bohn, York Street Garden Press and dated MDCCCLI (1851). 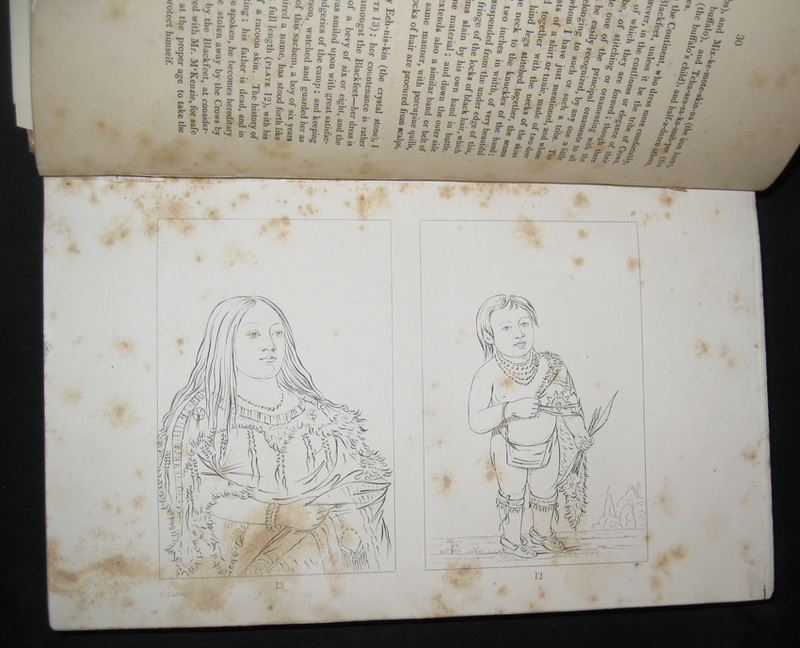 Each book has a dedication on the inside cover, typical of gift giving between family members, written in Quill pen calligraphy to 'Edward P. Lanfhean', Cincinnatti, March 24 1855 (or 1856? 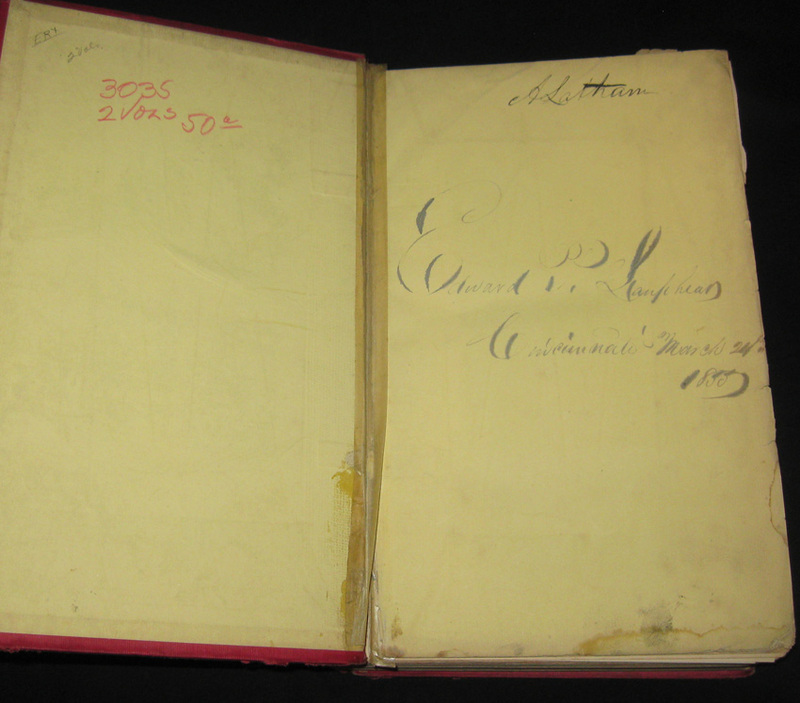 ), one volume with his own signature, and later, added with burned library ownership of 'A. LATHAM.' 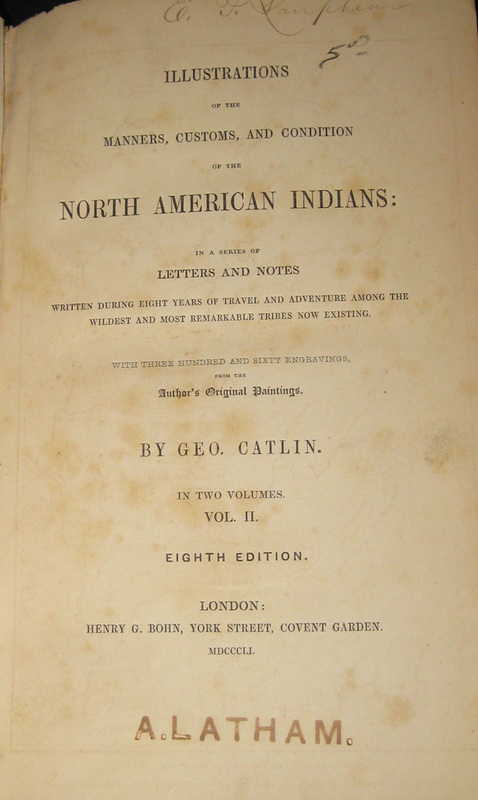 ( The dedications are not from Catlin, only owners of the books, as was typical of the time period). 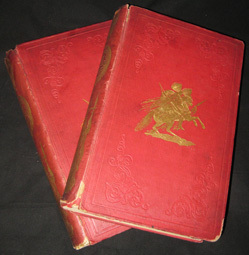 The volumes have weak spines, various brown spotting throughout, some pages loose, intermittent signatures by the original owner on pages, antiquarian dealer's prices over the last 150 years, etc.. A wonderful historical record. 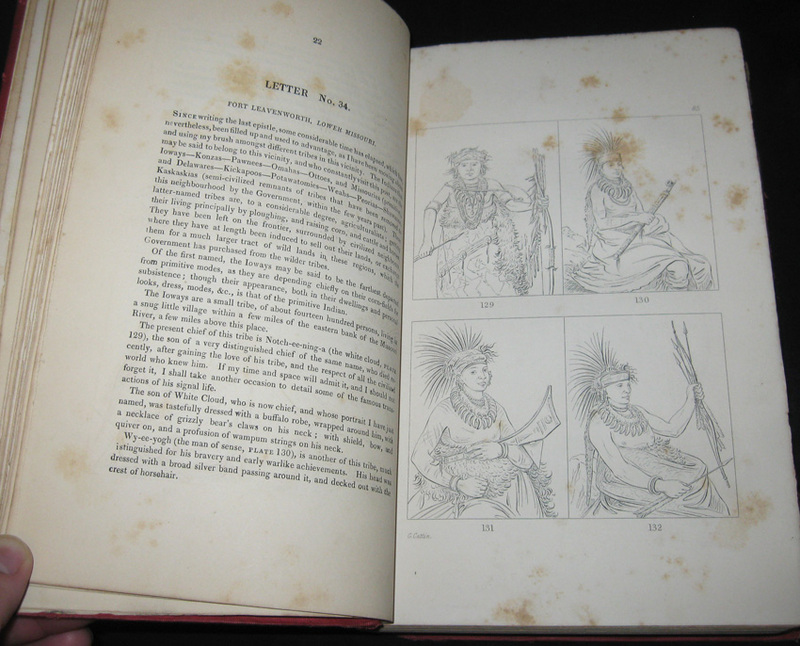 All pages appear to be in both volumes..
NA237 Fantastic, Rare Mission/ Arts and Crafts Period picture frame with a Native American theme, circa 1890-1910. This wonderfully decorated antique picture frame is crafted from dark stained oak, similar to Roycroft or Stickley furniture. 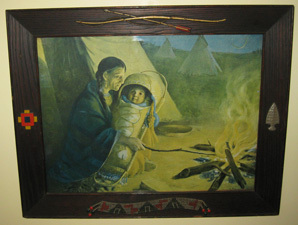 The original frame is embellished with relief appliques that appear to be early molded wood composite plastics painted with enamel surfaces, the top with a yellow and red bow and arrow; the lower, an intricately detailed bead bandolier in cream, red, and green; to the right is an arrowhead in gray; and, an ancient native american symbol on the left. The frame is all original, with original wavy glass; the lithograph in the frame is a vintage, insignificant print, probably from a 1950's calendar. The frame is in desperate need of a high quality artwork of the period, possibly a Curtis photo that would set the two off dramatically? An artwork such as this frame, is deserving of a similarly rare work! Outside measurements are 19 1/2 by 15 1/2 inches and the interior measurements will allow for exactly 16 by 12 inches.